When was your family’s last dental cleaning in Medford? If it’s been longer than six months since you visited the dentist, it’s time to schedule an appointment at Island Daily Dental Care. Even if you don’t think you necessarily need to visit the dentist, we want to remind you that regular preventive care is an essential part of healthy, long-lasting smiles. Without it, you’re setting yourself up for cavities, gum disease, and other oral health issues. Read more about the need for regular six month checkups and cleanings, then schedule an appointment today. Our hygiene team will remove all plaque and tartar from your teeth, then give them a polish to help your smile really sparkle. We can also discuss the particulars of any cosmetic treatments you may be interested in at this time, like professional teeth whitening. Your dentist will also complete a thorough examination. If we do find evidence of oral issues during your dental checkup in Medford, we will put together a plan for restorative treatment to help you enjoy full smile health again as soon as possible. If it’s been a while since you visited the dentist, you may need a tooth-colored filling or a deep cleaning to reverse gum disease. Custom-fitted nightguards may be prescribed to protect the tooth enamel against nighttime teeth grinding (bruxism). Our younger patients also benefit from topical fluoride treatments and dental sealants. Both can be performed at the end of the checkup and cleaning to provide lasting protection against cavities for young smiles. 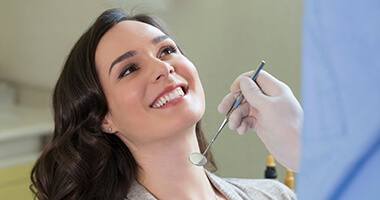 If you care for your smile properly in between appointments with your Medford dentist, your six month checkups and cleanings will be a breeze. Remember to brush your teeth for two minutes, after each meal or at least twice daily. Set a timer if you can’t seem to reach the two minute mark — or better yet, invest in an electric toothbrush that comes with an automatic timer. Floss your teeth once a day, maintain a balanced, nutritious diet, and avoid tobacco to enjoy lasting oral health. When was your last visit to the dentist? Remember that patients of all ages should visit our office every six months for a dental cleaning and checkup in Medford. Don’t delay — schedule an appointment at Island Daily Dental Care ASAP!